Pirate Summit is an annual startup gathering and conference taking place in Köln, Germany. Every year Pirate Summit and their network organise pitching events in several european countries in order to connect with the local ecosystems. Pirate Summit, organised by founders for founders, attracts every year 1.000 attendees, 650 founders, 200 investors and 80 pitches from 70+ countries and 60 speakers. Athens pitching event is being organised this Thursday, August 4th, by The Cube Athens and Found.ation. Winning startup will get 2 free tickets to enter Pirate Summit and compete with the rest of Europe during Walk the Plank. 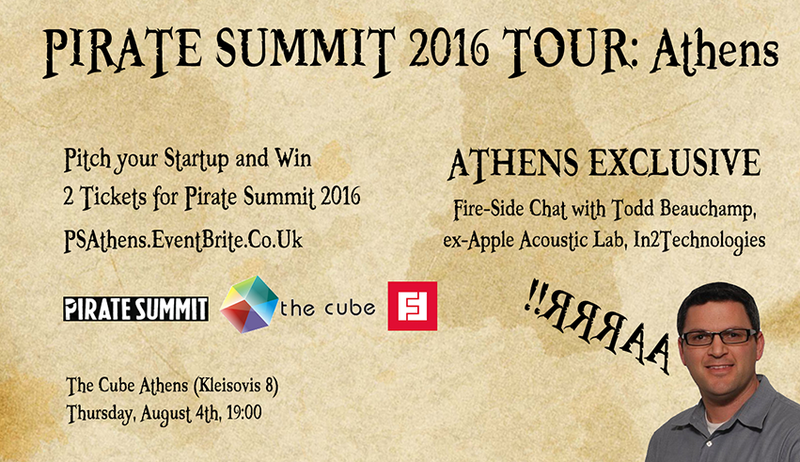 I will be joining the judging jury of Pirate Summit Athens 2016, along with Travelmyth’s Stefanos Vasdekis and John Nousis, Seek4parts’ George Drakoglou, Found.ation’s John Sclavos. Athens exclusive keynote speaker and jury member is Todd Beauchamp, President of In2Technologies and former manager of the Apple Acoustic Lab, who will be engaged on a fire-side chat with The Cube Athens’ Stavros Messinis. Apply to pitch your startup here, or reserve a free seat at the event here.